When you think of scenic views for dorm room posters, you probably think of New York City or London. You may have been wanting scenic views for your dorm essentials but wanted something a little different than a New York City skyline or London photograph. You want to create a unique dorm room decor style for yourself, so you may be at a loss for what to add to your dorm necessities for your college wall decor. However, you're not at a loss! 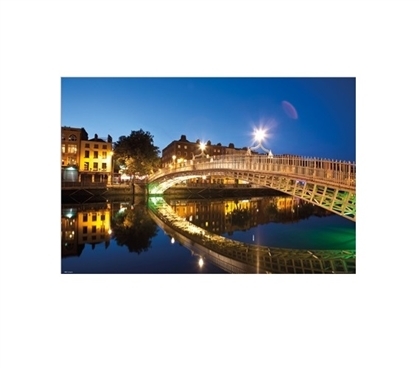 Our Dublin Halfpenny Bridge Landscape Dorm Room Poster is a unique dorm room poster of Dublin that is gorgeous for dorm room decor. This dorm essentials item has so much gorgeous design and color in it that will be an amazing pop of color for your college wall decor. From the yellow lighting in the buildings to the hint of green in the right side of this dorm necessities item, your dorm room decor will be brightened with this dorm item in your college supplies. Perhaps the most stunning feature of all though is the sky. The sky shifts from light blue to a deep royal blue for a stunning effect. The bridge and buildings are mirrored in the water below, making this dorm room decor item a must have dorm item that you won't be able to stop looking at!